As an innovation lab working in healthcare, The Helix Centre had a brilliant opportunity to host a pop-up exhibition in the grounds of the prestigious Imperial Hospital. With investors such as Google’s Deep Mind backing the project, it was an exciting and new endeavour for the team. The exhibition - Can of Worms - would explore the benefits and risks of sharing healthcare data, with the goal of engaging members of the public, NHS staff and patients in this topic. The exhibit was hung on the idea that talking about healthcare data is like opening a can of worms. This metaphor provided the jump-off point for the creative and copy. I was brought on board to develop the story-telling aspect of the pop-up as well as the supporting marketing communications and exhibition signage. We developed several initial ideas before setting on the final one. Visitors would enter the space and be invited to choose a can and physically open it. They would then place it to their ear and hear a short story relating to the condition or topic written on the can. They would then be invited to provide feedback on the story and place this on a wall alongside other people's views. 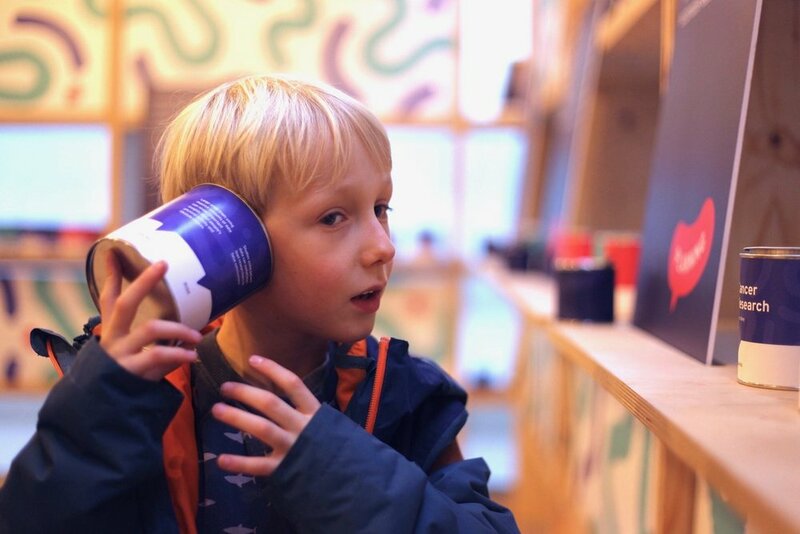 I helped develop the visitor experience, alongside Helix’s fantastic design team, and wrote over 25 stories that would be recorded and listened to. This task meant using medical research to craft compelling stories to get people thinking. Each story needed a risk and benefit to be woven into one narrative and needed to come from all different personalities and walks of life. I developed character profiles for each of these stories to aid the voice actors recording them. These stories can be listened to here.